We have received a lot of questions and requests to do a review on the HYIP site Multimine.net and today is just the day for that. This article presents a clear picture of the MultiMine scam and tells you what you need to know. As usual, comments and suggestions are very welcome. MultiMine.net, as you might derive from the name, is a Bitcoin cloud mining site that also dabbles as a High Yield Investment Program (HYIP). A cloud mining site, in simple terms, is a site that allows people to mine and acquire Bitcoin without necessarily requiring them to own the sophisticated software and hardware equipment required in ordinary mining. Cloud mining sites typically sell hashing power – which determines how fast one can mine bitcoins – to users while some sell ready mined BTC. Cloud mining sites make the majority of Bitcoin websites. Thus, as a cloud mining site, Multimine.net claims to enable you to acquire Bitcoin at affordable prices. As a matter of fact, the site gives out Free Miners, which include standard hash power, to all new accounts. However, the Free Miners alone won’t give you a meaningful number of BTC, you will need to rent some hashrate, which is an investment in itself. As with most cloud mining sites, the hashrate available on Multimine.net is generated by users who have the skills and knowledge to do so. In that case, they get commission, the site gets money and the other users get their BTC. Multi I – Requires an investment of 0.015 BTC and above up to 0.49 BTC. Gives out a daily interest of 1.65% for 180 days. Multi III – Minimum investment = 2.0 BTC, Maximum investment = 4.99 BTC. Matures in 180 days and pays ROI at a rate of 2.75% daily. Multi IV – Requires an investment of 5 BTC upwards and pays 3.65% interest daily for 180 days. In the above section, which by the way is directly picked from Multimine.net, you can note two major things. One, that the maturity dates on the investment plans differ from the general maturity date per contract as alleged in promotional material. Take a look at the screenshot below. 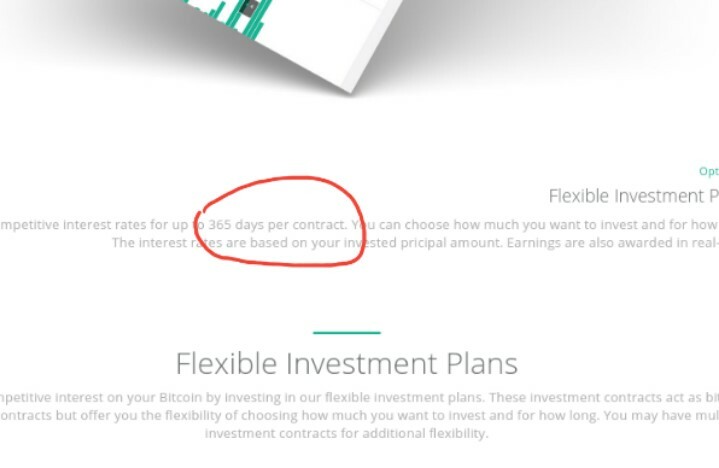 As you can see, they claim that a contract goes for 365 days while in the Investments section, all the listed plans go for 180 days. This shows how inconsistent in their lies the site’s creators are, which is something all fraudsters have in common. The other thing you may have noted, and probably dismissed it as a mistake on our part, is that the investment plans are listed starting from Multi I, Multi III and Multi IV. There is no Multi II. This could have been a mistake on the editor’s part but then again you cannot fully discount the probability that the creator of the MultiMine scam dropped out in 3rd Grade. The inconsistencies in his/her claims are just too much, not to mention the obvious contradiction. That said, it’s time to put on our critical lenses and face the ultimate question most of our friends have been asking: is MultiMine trustworthy? We answer that in the next section. Now, even the most experienced officers may not be able to tell when a suspect is lying during an interrogation straight away. For that reason, major intelligence agencies use polygraphs or lie detectors to detect lies and/or contradictions. Here at ScamBitcoin.com, we have our very own polygraph which we use to determine the trustworthiness of sites under review and therefore determine whether they are scams. What kind of returns does Multimine.net promise? MultiMine promises some big returns, typically up to 3.65% daily. Even on the lower side, 1.65% per day, the returns are still quite big considering that they are paid consistently for about 6 months. What more, MultiMine passes off all investments as risk free, meaning that investors are assured of daily profits plus their principal at the end of the contract. Normally, sites which promise such kinds of returns turn out to be scams. Also, if you have ever been involved in any legal business, you know that risk is a permanent, unavoidable factor of business. What kind of investments does the site partake in to generate revenue? That Multimine.net is a pyramid scheme where money from new investors is used to pay the older investors and so on until the chain is complete. That the site is involved in smne illegal businesses such as drug trafficking as such are the only investments that guarantee returns on the daily, that is if you avoid death or jail. The site could also be a money laundering scheme. Whatever the case, Multimine.net sure has something to hide, particularly on their income generating activities. And we wouldn’t want to find out what it is. Does the site have an About Us page? Nope. As a result, we don’t know who the owners of the site are and what are their motivations and objectives. How then can we trust faceless, nameless people with our money? We skimmed through the entire site and could not find a physical address or even a phone or email address. As it is, you have to send inquiry tickets to the support team to get assistance. In case of anything, tracking and recovering your money will require a miracle. Does the website have links to other legit websites? We tracked the sites which link back to Multimine.net and most of them turned out to be niche sites which have no meaningful content and use clickbait to attract traffic. We found no legit or respectable website linking to Multimine.net. At the time of writing, MultiMine.net had a ranking of 593,000 on Alexa.com, which means that it is one of the least popular sites in the world. Furthermore, most of its traffic comes from the US, Nigeria, India and Russia presumably because marketing efforts are directed to those areas where people are not exposed to cloud mining scams. The site is not as popular in much of Europe. If it is not yet clear from the scam test, MultiMine.net is a huge scam that has ripped of naive investors and is in the process of doing so to a lot more. Keep away. Verdit: MultiMine is a SCAM! If you have been scammed by MultiMine, please let us know by commenting below. We’ve just uploaded a MultiMining.website review as well.